Doing dishes is a daily task that is an absolute must. Liquid dish soaps are often comprised of strong formulas, that are really effective at cutting through grease and grime-as should be. But unfortunately, the soaps can be pretty rough on our hands. After washing the dishes with traditional dish soaps, the skin on my hands are always left feeling super dry and uncomfortable. I immediately slather on a hand cream just to get that suppleness and moisture back. Well, thanks to Palmolive®'s Soft Touch® dish liquid, my hands can rest a little easier! Palmolive®'s Soft Touch® dish liquid soaps are phosphate free and they contain mild formulas that are are not only tough on grease, but gentle on hands. I received two of Palmolive®'s Soft Touch® dish liquid soaps through Influenster to try out-Aloe and Vitamin E, and I couldn't be anymore pleased with them. These do a fab job at deep cleaning my dishes, and for once, my hands don't have to pay the price. My most favorite of the two has to be the one with Vitamin E. Vitamin E is a great moisturizer, so the fact this dish liquid contains it, is a nice treat. Overall: If you are tired of the harshness that some liquid dish soaps induce on skin, then I suggest looking into these Palmolive® Soft Touch® dish liquids. They do the job when it comes to cleaning dishes, all while being gentle on hands. What's not to love? Palmolive®'s Soft Touch® is available at Wal Mart. 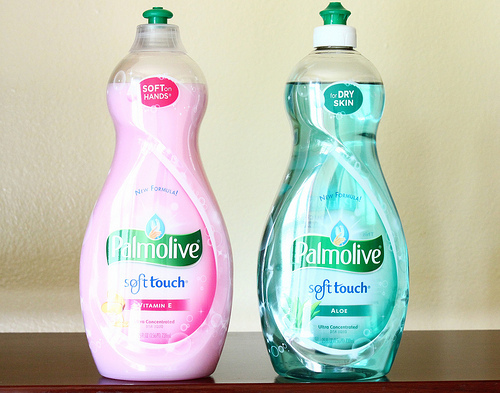 What do you all think of Palmolive®'s Soft Touch® dish liquid soap? Disclaimer: I received these products complimentary from Influenster for testing purposes. My reviews are always honest, never influenced, and my own.